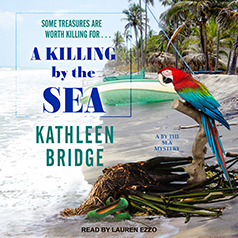 The breathtaking barrier island of Melbourne Beach, Florida, is every tourist's fantasy—until murder washes ashore . . .
Trading the urban sprawl of Manhattan for the tranquility and exotic beauty of a Florida barrier island was the best decision author Liz Holt ever made. What could be more ideal for relaxing, regrouping, and getting a writer's creative juices flowing than observing life at the unconventional hotel that has been in Liz's family for generations? But it's death that grips the island when a body sweeps in on the tide . . . The victim was a member of a fishing crew lost at sea who may or may not have drowned. Despite the corpse in their crosshairs, the staff of the Indialantic by the Sea Hotel and Emporium continues its plans for its first annual Pirates' Weekend. But things go further awry when both a hurricane and a killer leave a trail of destruction. Liz and her new boyfriend must figure out who's behind the carnage before they also end up in Davy Jones's locker . . .